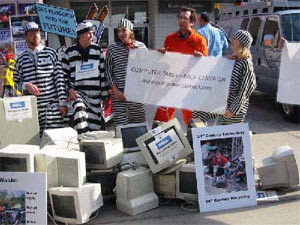 Did you know that inmates in the US are being afforded the opportunity to recycle eWaste? The program has been running since 1994, through an arm of the government-run corporation UNICOR which opened its first eWaste 'business' in Florida. Since then, the company’s electronics recycling program has spread to other federal prisons across the country. In 2005 the company recorded $64.5 million in profits; inmates get paid between 23 cents and 1.15 per hour for their services. Dell got nipped a while ago for supporting the practice; they have since discontinued it. What do they do? Well, when the program began, the job consisted of raising CRTs over their heads and smashing them down on metal tables to separate the glass from the recyclables. Ultimately inmates might want to reevaluate the risks, which are outlined in a excellent joint report entitled Toxic Sweatshops. In addition, the March 2007 issue of Prison Legal News has picked up on the practice, which suggests, amongst other things, that the program to just there to provide a labor intensive activity to keep inmates quiet. And, as the article reports, inmates are dying from the exposure to the toxic chemicals in the eWaste. What is most striking is that a baseline has not been established for this type of activity; not in a workplace rulebook, not in a federally mandated guide, but in peoples' minds. Computers are hazardous, they are filled with poisonous chemicals and materials, and need to be treated like poisonous waste. Not like something that can be smashed down on tables by inmates. About your post about Google with a black background today I made one like that. Is the same Google but all Black and grey...!